Editor:- August 31, 2010 - WhipTail Technologies today announced that a law firm customer - Finkelstein & Partners (350 attorneys and staff distributed across 17 locations) had achieved a 4x capacity reduction when using their SSD instead of HDDs in virtualized server apps - due to dedupe and faster IOPS. Editor:- August 31, 2010 - Fusion-io today showed how its PCIe SSDs can enable users to run 512 virtual desktops on a single vSphere host in a demo at VMworld . "Fusion-io is changing the way customers think about data-center architecture, driving further efficiency, consolidation and scalability into virtual platforms," said Neil Carson, CTO of Fusion-io. "Fusion's ability to efficiently handle the highly random access patterns prevalent in virtualized workloads, aids customers in reducing the cost and complexity of adding multiple virtual machines." Editor:- August 31, 2010 - StorageSearch.com revealed today that searches for "SSD" this month were 33% higher than a year ago. We're now 2/3 of the way through the calendar year that I christened the Year of the SSD Market Bubble - so how's it going so far? It's clear from looking at interim financial data from across the industry - and matching that up with unpublished data from private companies that 2010 will easily end up being the 1st multi-billion dollar year in this market. That's peanuts compared to where the market is headed - but it's a significant milestone in SSD market history. I do hear a few gripes from vendors that the SSD market isn't doing as well as they expected - these mostly arise from vendors with weak technology whose product managers didn't understand the market when they made their product plans. Customer expectations in the SSD market are being set by the top 10 SSD companies - and not the bottom 10. Editor:- August 30, 2010 - Conduant announced new optical options for its StreamStor mezzanine data recorders enabling upto 800MB/s per port and 3GB/s for a 4 port confguration and cable lengths upto 16 miles. Conduant's founder and CEO Ken Owens said - "Our Optical High Speed Serial Mezzanine Board can be upgraded and customized in the field as requirements demand and allows for recording from multiple devices simultaneously in any environment. With our StreamStor technology, all packet formation and management is performed by the hardware so there is no latency or other delays to affect data transmission performance." Editor:- August 30, 2010 - Jon Mills, Director of European operations at SEPATON recently published an article - Tape - the T Rex of backup? - which provides anthropological comparisons between tape libraries and these popular creatures. I guess it takes one soon-to-be-extinct dinosoar to recognize another. My own view is that hard disk based backup will eventually be replaced by solid state backup. So enjoy chewing the spinning magnetic leaves while they last. 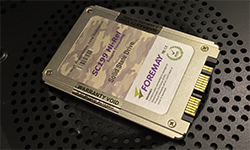 Editor:- August 27, 2010 - Microsemi now offers a 16GB SLC NAND version of its PBGA SSDs - which are designed specifically for use in the rugged and demanding environments of defense and aerospace applications. The surface-mountable PATA SSD has an integrated 32-bit RISC flash controller which manages wear leveling, error correction and power interruption protection. 10,000x more reliable than RAID? Editor:- August 26, 2010 - Amplidata claims that its BitSpread technology is 10,000x more reliable than current RAID based technologies and requires 3x less storage. Is another new way of fixing reliability problems in hard disk arrays worth the effort just as we approach the end of the hard disk market's life? - I doubt it. See why in - this way to the petabyte SSD. Editor:- August 25, 2010 - in an effort to improve its prospects in the datacenter market - WhipTail Technologies today announced a new name for its NAS SSDs - Datacenter XLR8r instead of Racerunner - and also unveiled HA options which involve dual failover systems. The little lizardy creatures are still on WhipTail 's site. Serious SSD buyers aren't scared by animal brands. Editor:- August 24, 2010 - OCZ today announced plans to wind down its commodity DRAM business and focus more resources on SSDs. Ryan Petersen, CEO of the OCZ Technology Group, Inc. said - "Our R&D driven SSD business is performing well and is anticipated to be the majority of our revenue going forward..."
Editor's comments:- Once you've got a market acceptable recipe - the profit margins for cake can be much better than those for flour. So if you have a choice it's better to make cake. The SSD market isn't big enough yet for huge memory makers like Samsung to make the grind or bake decision. They have to do both. But in the distant future it may be different. STEC made the SSD bake decision in Februray 2007. There's a growing consensus that DWPD should map into recognizable application zones and price bands. Editor:- IO Turbine has published a list of 5 Mistakes to Avoid when trying to solve I/O Bottlenecks in Virtualized Servers. Among other things - IO Turbine says "While many enterprise-class storage providers offer automatic tiering with data migration to and from the SSD storage, these solutions typically take place well after the need for the I/O acceleration has passed."